This pasta bowl uses up last season's tomato jam that's been hidden away in the freezer and some of the tall oregano that's currently busy taking over the front flowerbed. If you blanch and freeze a container of fresh arugula ahead of time and store it in the freezer right by the jam, you can put this together pretty quickly whenever you're ready. It's a really comforting lunch or weeknight dinner and could be a nice as a cold pasta salad as well. Set aside prepared orzo and arugula. Heat oil in skillet and then add onion and garlic. Let that mixture brown and stir it occasionally. Add tomato paste caramelize it with the onions. Add jam and mix. Deglaze the pan with wine and push a spatula or wooden spoon around to scrape the skillet clean. Add arugula and orzo and mix. Serve in bowls with salt, pepper. 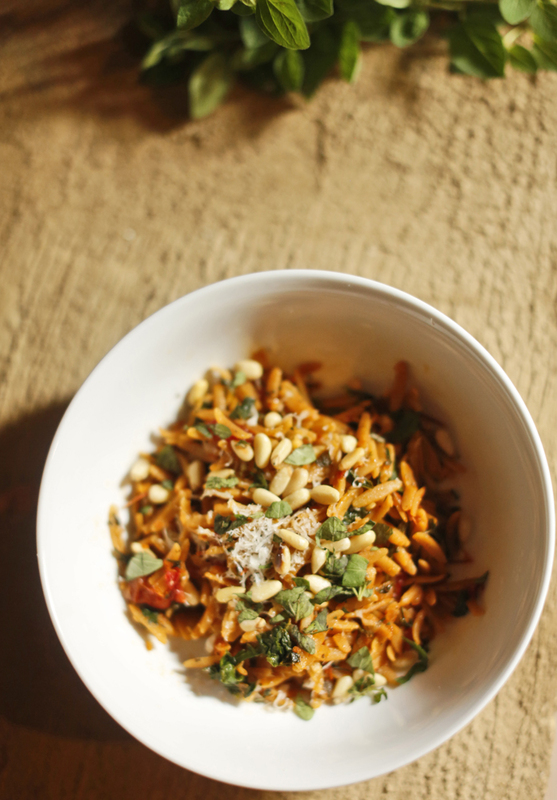 pine nuts, and oregano sprinkled on top. i love these flavors you chose, this looks amazing!